Kix (stylized as KiX) is a brand of American cold breakfast cereal introduced in 1937 by the General Mills company of Golden Valley, Minnesota. 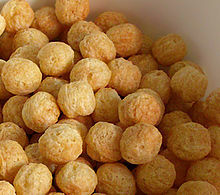 The product is an extruded, expanded puffed-grain cereal made with cornmeal. Honey Kix, enlarged to show texture. General Mills introduced Berry Berry Kix in 1992 and Honey Kix in 2009. In Original Kix, total sugars are about 10% by weight, which is about 3 grams of sugar per serving. Honey Kix has 6 grams of sugar, Berry Berry Kix 7 grams. The grain is processed and expanded (water is added and the corn is pulverized). Cooking of Kix occurs in the extruder, then the dough is formed into the desired shape by extrusion through a die. It was the first cereal to be manufactured using this process. Experimentation with this puffing process led to other popular brands like Cheerios. In 1947, Kix offered a Lone Ranger atomic bomb ring in exchange for a box top and 15 cents. The ring contained a spinthariscope, so that when the red base (which served as a "secret message compartment") was taken off, and after a period of time for dark adaptation, you could look through a small plastic lens at scintillations caused by polonium alpha particles striking a zinc sulfide screen. The slogan "Kid Tested. Mother Approved." was introduced in 1978. During the 1980s, television commercials included the jingle "Kids love Kix for what Kix has got. Moms love Kix for what Kix has not," the latter in reference to its claims of no added food coloring or flavors. In 2018, the slogan was updated to "Kid-tested. Parent-approved." ^ "Brands: Cereals: Kix". General Mills. Retrieved 2 February 2014. ^ "Kix: Products". Kix official website. Retrieved 1 February 2014. ^ Grayson, Amanda. "Invention blasts off our cereal division". www.generalmills.com. General Mills. ^ "Lone Ranger Atomic Bomb Ring". orau.org. ^ "20 Most Memorable Cereal Slogans - MrBreakfast.com". www.mrbreakfast.com. This page was last edited on 23 December 2018, at 06:37 (UTC).